Author contributions: Takeuchi M designed the study and contributed experimental reagents; Takino J and Nagamine K performed the study; Nagamine K analyzed data; Takino J wrote the paper; and Hori T reviewed the paper. Supported by Grants from the Japan Society for the Promotion of Science, No. 22300264 and No. 25282029. AIM: To study the formation of intracellular glyceraldehyde-derived advanced glycation end products (Glycer-AGEs) in the presence of high concentrations of fructose. METHODS: Cells of the human hepatocyte cell line Hep3B were incubated with or without fructose for five days, and the corresponding cell lysates were separated by two-dimensional gradient sodium dodecyl sulfate-polyacrylamide gel electrophoresis. Glycer-AGEs were detected with the anti-Glycer-AGEs antibody. Furthermore, the identification of the proteins that are modified by glyceraldehyde in the presence of high concentrations of fructose was conducted using matrix-assisted laser desorption/ionization time-of-flight mass spectrometry (MALDI-TOF-MS). The protein and mRNA levels were determined by Western blotting and real-time reverse transcription PCR, respectively. RESULTS: The results of the two-dimensional gradient sodium dodecyl sulfate-polyacrylamide gel electrophoresis indicated a greater amount of Glycer-AGEs in the sample exposed to high concentrations of fructose than in the control. The detected Glycer-AGEs showed isoelectric points in the range of 8.0-9.0 and molecular weights in the range of 60-80 kDa. The heterogeneous nuclear ribonucleoprotein M (hnRNPM), which plays an important role in regulating gene expression by processing heterogeneous nuclear RNAs to form mature mRNAs, was identified as a modified protein using MALDI-TOF-MS. Increasing the concentration of fructose in the medium induced a concentration-dependent increase in the generated Glycer-AGEs. Furthermore, in an experiment using glyceraldehyde, which is a precursor of Glycer-AGEs, hnRNPM was found to be more easily glycated than the other proteins. CONCLUSION: The results suggest that glyceraldehyde-modified hnRNPM alters gene expression. This change may cause adverse effects in hepatocytes and may serve as a target for therapeutic intervention. Core tip: Excessive intake of fructose contributes to the development of nonalcoholic fatty liver disease and to the progression of the disease to nonalcoholic steatohepatitis. Fructose is metabolized to glyceraldehyde, which is a precursor of glyceraldehyde-derived advanced glycation end-products (Glycer-AGEs). We showed that intracellular Glycer-AGEs were formed in the presence of high concentrations of fructose. Additionally, heterogeneous nuclear ribonucleoprotein M (hnRNPM) was identified as one of the target proteins for glycation. These results suggest that the glyceraldehyde-modified hnRNPM resulting from the exposure of the cells to high concentrations of fructose, alters gene expression and causes adverse effects in hepatocytes. Fructose is a major component in high fructose corn syrup (HFCS) and sucrose, which are commonly used as sweeteners in beverages and processed foods. The consumption of fructose has increased over the past 40 years, and HFCS consumption has increased rapidly to replace 50% of the sucrose consumption. HFCS is cheaper than sucrose and can be transported easily; moreover, it is more effective in stabilizing the texture of some processed foods than sucrose[1,2]. Increased fructose intake causes many adverse effects such as obesity, dyslipidemia, and insulin resistance, and contributes to the development and progression of nonalcoholic fatty liver disease (NAFLD). NAFLDs ranging from simple steatosis to steatohepatitis include the most common liver diseases worldwide[1-5]. Advanced glycation end-products (AGEs) are formed by the Maillard reaction, a nonenzymatic reaction between the ketones or aldehydes of sugars and the amino groups of proteins. AGEs are associated with aging and diabetes-related pathologic complications[6,7]. This reaction begins with the conversion of reversible Schiff base adducts to more stable covalently bound Amadori rearrangement products. Over the course of days to weeks, these Amadori products undergo further rearrangement reactions to form irreversibly bound moieties known as AGEs. Recent studies have suggested that AGEs can be formed not only from sugars, but also from carbonyl compounds produced as a result of the autoxidation of sugars and from other metabolic pathways[9,10]. Evidence suggests that the glyceraldehyde-derived AGEs (Glycer-AGEs) are associated with diabetes-related pathologic complications[11-13]. Absorbed fructose is selectively metabolized in the liver and later metabolized into glyceraldehyde by aldolase[1,2]. The immunohistochemical analysis of Glycer-AGEs show intense staining in the livers of patients with nonalcoholic steatohepatitis (NASH), which is a form of NAFLD. It is well known that AGE modification adversely alters protein function[15,16]. However, the effects of fructose on the formation of intracellular Glycer-AGEs remain poorly understood. In this study, we have examined the formation of intracellular Glycer-AGEs in the human hepatocyte cell line Hep3B when exposed to high concentrations of fructose. All chemicals were commercial samples of high purity and used as supplied. Glyceraldehyde was purchased from Nakalai Tesque (Kyoto, Japan). Hep3B cells were grown in Dulbecco’s modified Eagle’s medium (DMEM; Sigma-Aldrich, St. Louis, MO, United States) supplemented with 10% fetal bovine serum (Equitech-Bio, Kerrville, TX, United States) under standard cell culture conditions (humidified atmosphere, 5% CO2, 37 °C). Cells (2 × 105 cells/mL) were seeded in various plates or culture dishes (BD Biosciences, Franklin Lakes, NJ, United States) and incubated for 24 h before the start of all experiments. To form intracellular Glycer-AGEs, cells were incubated with or without 0.5-10.0 mmol/L fructose for 120 h.
In the sodium dodecyl sulfate-polyacrylamide gel electrophoresis (SDS-PAGE) sample, cells were washed with ice-cold Ca2+- and Mg2+-free PBS [PBS(-)] and subjected to lysis buffer [25 mmol/L Tris-HCl (pH 7.6), 150 mmol/L sodium chloride, 1% Nonidet P-40, 1% sodium deoxycholate, 0.1% SDS, and 1× protease inhibitor cocktail (Thermo Fisher Scientific Inc., Waltham, MA, United States)]. Subsequently, cell lysates were passed through a syringe several times for further homogenization, and they were centrifuged at 12000×g for 10 min at 4 °C. After the protein concentrations were measured, cell lysates were dissolved in LDS sample buffer (Invitrogen of Thermo Fisher Scientific) containing 10% sample reducing agent (Invitrogen) and boiled for 10 min at 70 °C. In the two-dimensional gradient SDS-PAGE sample, cells were washed with ice-cold PBS(-) and subjected to 10% trichloroacetic acid for 30 min at 4 °C. Subsequently, collected cells were washed with PBS(-) and dissolved in urea buffer (2 mol/L thiourea, 7 mol/L urea, 3% CHAPS, 1% Triton X-100, 10% sample reducing agent) for 30 min at 4 °C. The resulting suspension was centrifuged at 20000×g for 30 min at 4 °C. Protein concentrations were measured using the Bradford assay (Bio-Rad Laboratories Inc., Hercules, CA, United States). After measuring the protein concentrations, cell lysates that modified acrylamide (100 μg) were separated in agar gel (pH range: 3-10 or 5-10) (ATTO, Tokyo, Japan) and 5-20% SDS-polyacrylamide gradient gel (ATTO). All processes were performed according to the manufacturer’s instructions. After two-dimensional gradient SDS-PAGE, the gel was stained with EzStain Aqua (ATTO) for 3 h and washed with distilled water. The selected spots were identified by matrix-assisted laser desorption/ionization time-of-flight mass spectrometry (MALDI-TOF-MS) analysis. We consigned MALDI-TOF-MS analysis to Genomine, Inc (Kyungbuk, Korea). Cell lysates were separated by electrophoresis and then electro-transferred onto polyvinylidene difluoride (PVDF) membranes (Millipore Corporation, Billerica, MA, United States). Membranes were blocked for 60 min by using the PVDF blocking reagent for Can Get Signal (Toyobo, Osaka, Japan). After washing with PBS containing 0.05% Tween 20 (PBS-T), the membranes were incubated with rabbit anti-Glycer-AGEs antibody, mouse anti-heterogeneous nuclear ribonucleoprotein M (hnRNPM) antibody (Millipore), mouse anti-β-actin antibody (Santa Cruz Biotechnology, Dallas, TX, United States), or rabbit anti-GAPDH antibody (GeneTex, Irvine, CA, United States) in Can Get Signal Solution 1 (Toyobo) for 1 h. Subsequently, the membranes were washed three times with PBS-T and incubated with anti-rabbit IgG antibody (GeneTex) or anti-mouse IgG antibody (Dako of Agilent Technologies, Santa Clara, CA, United States) in Can Get Signal Solution 2 (Toyobo) for 1 h. After five additional washes with PBS-T, immunoreactive proteins were detected using ECL Prime Western Blotting Detection Reagents and Amersham hyperfilm ECL (GE Healthcare Ltd., Little Chalfont, Buckinghamshire, United Kingdom). Glycer-AGEs were prepared as described previously. Briefly, 25 mg/mL of bovine serum albumin (BSA; A0281, Sigma-Aldrich) was incubated at 37 °C for 7 d under sterile conditions with 0.1 mol/L glyceraldehyde and 5 mmol/L diethylenetriaminepentaacetic acid (Dojindo Laboratories, Kumamoto, Japan) in 0.2 mol/L phosphate buffer (pH 7.4). As a control, unglycated BSA was incubated under the same conditions, but without glyceraldehyde. The unglycated and glycated albumin were purified using a PD-10 column (GE Healthcare Ltd.) and dialysis against PBS. All preparations were tested for endotoxin using the Endospecy ES-20S system (Seikagaku Co., Tokyo, Japan). Protein concentrations were determined using the Dc protein assay reagent (Bio-Rad Laboratories) using BSA as a standard. The amount of Glycer-AGEs-BSA required to neutralize rabbit anti-Glycer-AGE antibody was calculated based on a standard curve of Glycer-AGEs-BSA in a competitive ELISA. The antibody was incubated with 50 μg/mL of Glycer-AGEs-BSA for 1 h at room temperature and it was used for the subsequent experiments. Total RNA was isolated from Hep3B cells using ISOGEN II (Nippon Gene, Tokyo, Japan), and cDNA was synthesized using random primers and reverse transcriptase. Real-time reverse transcription-PCR was performed using a Smart Cycler II System (Takara, Shiga, Japan), as previously described. The primers used were as follows: hnRNPM, 5′-GAG GCC ATG CTC CTG GG-3′ and 5′-TTT AGC ATC TTC CAT GTG AAA TCG-3′; and β-actin, 5′-TCC ACC TCC AGC AGA TGT GG-3′ and 5′-GCA TTT GCG GTG GAC GAT-3′. All experiments were performed in duplicate and repeated at least two or three times. Each experiment yielded essentially identical results. Data are expressed as the mean ± SD. The significance of differences between group means was determined using a t-test. P < 0.05 was defined as significant. We examined whether intracellular Glycer-AGEs were formed by exposure to high fructose concentrations. 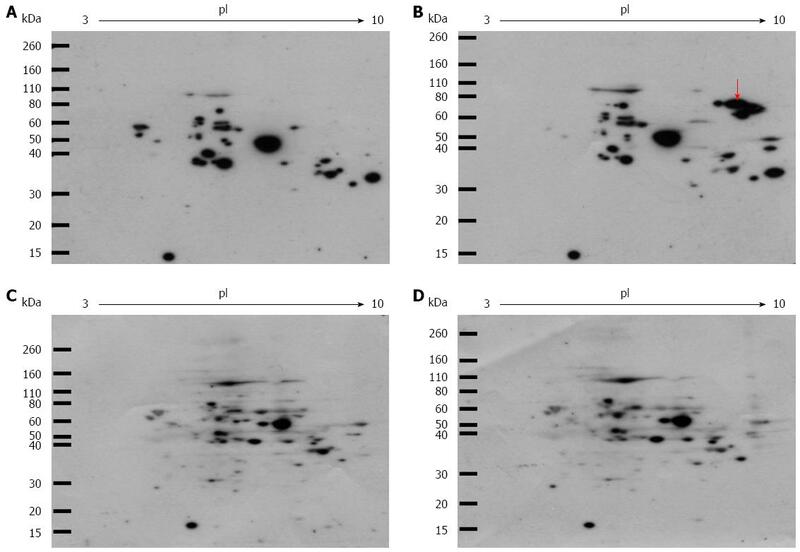 In a Western blot analysis using the anti-Glycer-AGEs antibody after two-dimensional gel electrophoresis, various spots were detected in the control and fructose samples (Figure 1A and B). 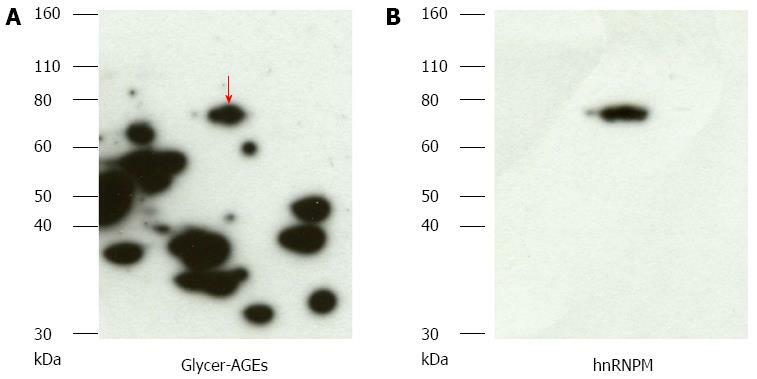 Western blot analysis using neutralized anti-Glycer-AGEs antibody was used to clarify the nonspecific spots, which showed no difference in their expression levels or expression pattern between the two samples (Figure 1C and D). In the sample that was exposed to high fructose concentrations, the Glycer-AGE spots were observed to have isoelectric points in the range of 8.0-9.0 and molecular weights in the range of 60-80 kDa (Figure 1B arrow). Figure 1 Western blot analysis of intracellular glyceraldehyde-derived advanced glycation end-products. Cells were incubated with or without 2 mmol/L fructose for 5 d. Cell lysates (100 μg of protein/gel) were separated on two-dimensional gradient sodium dodecyl sulfate-polyacrylamide electrophoresis and probed with Anti-glyceraldehyde-derived advanced glycation end-products (Glycer-AGEs) antibody (A, B), or anti-Glycer-AGEs antibody neutralized by an excess of Glycer-AGEs-bovine serum albumin (C, D); A,C: control samples; B,D: Fructose samples. The arrow shows spots where a difference was seen. After two-dimensional gel electrophoresis, for the sample exposed to high concentrations of fructose, the gel was stained with Coomassie blue (Figure 2). The gel spots that matched those detected with anti-Glycer-AGEs antibody were identified by mass spectrometry analysis. We identified four spots of Glycer-AGEs (Figure 2 circle), and interestingly, all four proteins were hnRNPM (Table 1). The spots detected with anti-Glycer-AGEs antibody were in accordance with the spots detected with anti-hnRNPM antibody (Figure 3). Table 1 Identification of intracellular glyceraldehyde-derived advanced glycation end-products formed by high fructose exposure. Selected spots were identified by matrix-assisted laser desorption/ionization time-of-flight mass spectrometry analysis. The number and the position of the four selected spots refer to the numbered spots in Figure 2B. Figure 2 Coomassie blue staining of the two-dimensional gradient gel. A: High fructose exposure samples were separated on two-dimensional gradient sodium dodecyl sulfate-polyacrylamide electrophoresis and then stained with EzStain Aqua; B: Higher magnification of the square region of the left panel. The number and the position of the four selected spots are indicated by circles. Figure 3 Detection of glyceraldehyde modification of heterogeneous nuclear ribonucleoprotein M by high fructose exposure. A: Samples exposed to high fructose concentrations were separated on two-dimensional gradient sodium dodecyl sulfate-polyacrylamide electrophoresis and probed with anti-glyceraldehyde-derived advanced glycation end-products (Glycer-AGEs) antibody. The arrow shows spots where a difference was seen; B: They were reprobed with heterogeneous nuclear ribonucleoprotein M (hnRNPM) antibody. We examined the effects of exposure to high fructose concentrations on the modification of hnRNPM by glyceraldehyde. Fructose exposure induced a concentration-dependent increase in glyceraldehyde modification of hnRNPM, but it did not increase the protein or mRNA levels of hnRNPM (Figure 4). Figure 4 Effects of glyceraldehyde modification of heterogeneous nuclear ribonucleoprotein M by high fructose exposure. Cells were incubated with 0.5-10.0 mmol/L fructose for 5 d. A: Cell lysates were separated on two-dimensional gradient sodium dodecyl sulfate-polyacrylamide electrophoresis (SDS-PAGE) and the glyceraldehyde modification of heterogeneous nuclear ribonucleoprotein M (hnRNPM) was determined by probing with anti-Glycer-AGEs antibody. The arrow shows spots identified with hnRNPM; B: Cell lysates were separated by SDS-PAGE and probed with anti-hnRNPM antibody. Equal protein loading was determined using anti-β-actin antibody; C: The levels of mRNA expression were analyzed by real-time RT-PCR, and the result was normalized to β-actin. Data are shown as mean ± SD (n = 6); aP < 0.05 vs control. Left panel: With 2 mmol/L fructose, right panel: With 10 mmol/L fructose. Next, we examined the effects of the modification of hnRNPM by glyceraldehyde, which is a precursor of Glycer-AGEs. 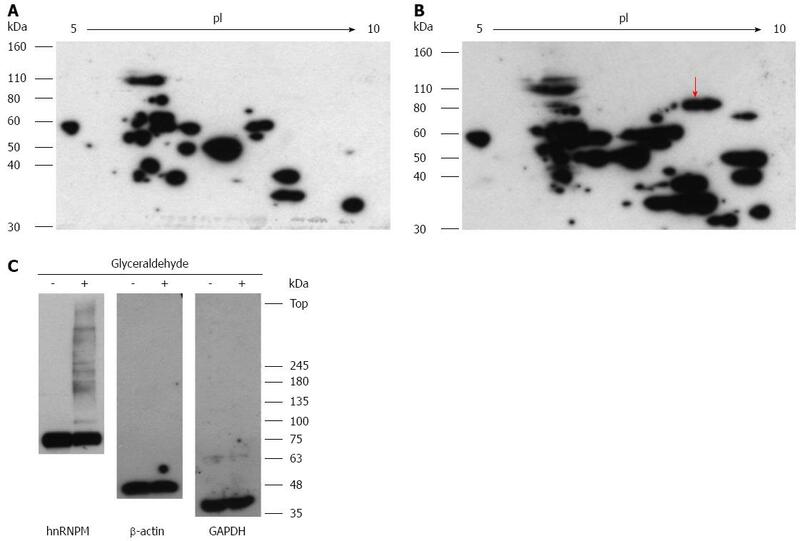 After 5 d in culture, the cells were incubated with or without 4 mmol/L glyceraldehyde for 6 h. Western blot analysis using anti-Glycer-AGEs antibody after two-dimensional gel electrophoresis showed that the various spots of the glyceraldehyde sample were detected more strongly than the control sample (Figure 5A and B). The spot of hnRNPM was also included (Figure 5B arrow). Furthermore, Western blot analysis using anti-hnRNPM antibody showed the bands that shifted to the top, whereas the hnRNPM protein of 68 kDa was decreased by the addition of glyceraldehyde. On the other hand, such a change was not seen in β-actin or GAPDH (Figure 5C). Figure 5 Effects of glyceraldehyde modification of heterogeneous nuclear ribonucleoprotein M. Hep3B cells were incubated for 5 d and incubated with or without 4 mmol/L glyceraldehyde for 6 h. Cell lysates were separated on two-dimensional gradient sodium dodecyl sulfate-polyacrylamide electrophoresis (SDS-PAGE) (A, B); or SDS-PAGE and probed with anti-Glycer-AGEs antibody (C). A: Control sample; B: Glyceraldehyde sample. The arrow shows spot identified with heterogeneous nuclear ribonucleoprotein M (hnRNPM). Glycer-AGEs cause various intracellular and extracellular adverse effects. Extracellular Glycer-AGEs interact with receptors for AGEs and increase oxidative stress by the production of reactive oxygen species in the cell. On the other hand, intracellular Glycer-AGEs cause a functional change in the protein itself[11,12]. We previously observed that glyceraldehyde, which is a precursor of Glycer-AGEs, increases the intracellular Glycer-AGEs in Hep3B cells. Among the intracellular Glycer-AGEs that were formed, heat shock cognate 70 was identified as a glyceraldehyde-modified protein, and the modification by glyceraldehyde reduced the activity of the protein. In the liver, glyceraldehyde is believed to be produced by two pathways: the glycolytic pathway and the fructose metabolic pathway. Fructose metabolism involves fructokinase and is especially important in the liver after food intake. Fructose is phosphorylated to fructose-1-phosphate (F-1-P) by a specific kinase, and the liver aldolase B can cleave F-1-P to produce dihydroxyacetone phosphate and glyceraldehyde. Therefore, the liver more readily accumulates glyceraldehyde than other organs. In this study, we have described the formation of intracellular Glycer-AGEs induced by high fructose exposure in Hep3B cells. Whether the in vitro addition of fructose to hepatocytes is physiologically relevant is an important issue for further research. Le et al demonstrated that the baseline fructose level in the human peripheral vein was about 5 μmol/L, and after ingestion of 24 oz of HFCS-sweetened beverages, this level increased to 0.3 mmol/L. Fructose absorbed in the small intestine is carried to the portal vein. Therefore, it is expected that the portal vein has higher fructose levels than the peripheral vein. Furthermore, Sugimoto et al demonstrated that the peak concentration of portal fructose was approximately ten times that of peripheral fructose after sucrose ingestion in rats. This is consistent with our findings, which show that Glycer-AGEs were detected even when the concentration of fructose was less than 3 mmol/L. Heterogeneous nuclear ribonucleoproteins, which directly bind to nascent RNA polymerase II transcripts, play an important role in processing heterogeneous nuclear RNAs to form mature mRNAs and in regulating gene expression. It is known that hnRNPM appears as a cluster of four proteins, M1-4, of 64-68 kDa in two-dimensional gel electrophoresis. We showed that a Glycer-AGE, which we identified to be hnRNPM, is a modified protein that was detected in cells exposed to high fructose concentrations, and this exposure induced a concentration-dependent increase in Glycer-AGEs (glyceraldehyde-modified hnRNPM). It is known that the ketones or aldehydes of sugars can modify the side chains of lysine and arginine residues in proteins[24,25]; Cotham et al demonstrated that dicarbonyl compounds react primarily with arginine residues. Lysine and arginine, amino acids that have a basic side chain, are important in RNA-protein interactions[27-31]. In particular, the function of hnRNPM may be to influence lysine sumoylation and arginine methylation, which are post-translational modifications[32,33]. Furthermore, hnRNPM possesses an unusual hexapeptide-repeat region rich in methionine and arginine residues (MR repeat motif), and this motif may participate in the formation of Glycer-AGEs. In experiments where glyceraldehyde is externally added, the bands that shifted to the top appeared, while the level of 68-kDa hnRNPM protein was decreased. It is well known that the glycation of proteins forms intermolecular crosslinking[34-36]. Therefore, it is thought that this phenomenon of crosslinking characterizes glycation. However, no crosslinking was observed in β-actin or GAPDH. This suggests that the hnRNPM protein was more easily glycated than the other proteins. Finally, in order to understand hnRNPM function, we used RIP-Chip analysis in Hep3B cells to identify the genes that are controlled by hnRNPM. The results showed that apolipoprotein E (APOE) and fibrinogen-like 1 (FGL1) were included in the top 50 such genes (Table 2). It is known that APOE is a ligand for low-density lipoprotein receptors and participates in the transport of cholesterol and other lipids. It was reported that the APOE polymorphism is significantly associated with NASH. Furthermore, APOE-deficient, APOE*3-Leiden (variant form of APOE), and APOE2 knock-in (APOE2ki) mice are widely used as models of liver steatosis[39-43]. These mice were maintained on a high-fat diet to allow the development of NASH[40-43]. It is also known that FGL1 expression is induced after liver injury; FGL1 stimulates hepatocyte proliferation and protects hepatocytes from injury[44-46]. Table 2 Top 50 RNA targets of heterogeneous nuclear ribonucleoprotein M in Hep3B cells. RNA-hnRNPM complexes were co-immunoprecipitated with anti-heterogeneous nuclear ribonucleoprotein M antibody bound to protein G-magnetic beads, and RNAs were isolated and identified by microarray analysis. In conclusion, among the intracellular Glycer-AGEs that were formed, hnRNPM was identified as a glyceraldehyde-modified protein, and it was more easily glycated than the other proteins. Therefore, we believe that the gene responsible for NAFLD and NASH is among those whose expression is regulated by hnRNPM. These results suggest that intracellular Glycer-AGEs may play a critical role in the pathogenesis of NAFLD and NASH and may serve as potential targets for therapeutic intervention. A further analysis of the target genes of hnRNPM will be necessary in the future. Excessive intake of fructose contributes to the development of nonalcoholic fatty liver disease and to the progression of the disease to nonalcoholic steatohepatitis (NASH). Fructose is metabolized to glyceraldehyde, which is a precursor of glyceraldehyde-derived (Glycer)-advanced glycation end-products (AGEs). AGEs are formed by the Maillard reaction, a nonenzymatic reaction that occurs between the ketones or aldehydes of sugars and the amino groups of proteins. AGEs are associated with aging and diabetes-related pathologic complications. The immunohistochemical analysis of Glycer-AGEs shows an intense staining in the livers of patients with NASH. However, the effects of fructose on the formation of intracellular Glycer-AGEs remain poorly understood. Evidence suggests that among the various AGEs, Glycer-AGEs are associated with diabetes-related pathologic complications, NASH, and cancer. The extracellular Glycer-AGEs-receptor for AGE signaling pathway is well understood, and it has been previously shown that AGE modifications adversely alter protein functions. In this study, the authors examined the formation of intracellular Glycer-AGEs in the presence of high concentrations of fructose. This study reported the formation of intracellular Glycer-AGEs and identified the glyceraldehyde-modified proteins by exposing the cells to high fructose concentrations. The experimental data can be used in further studies for therapeutic intervention using these Glycer-AGEs as potential targets. 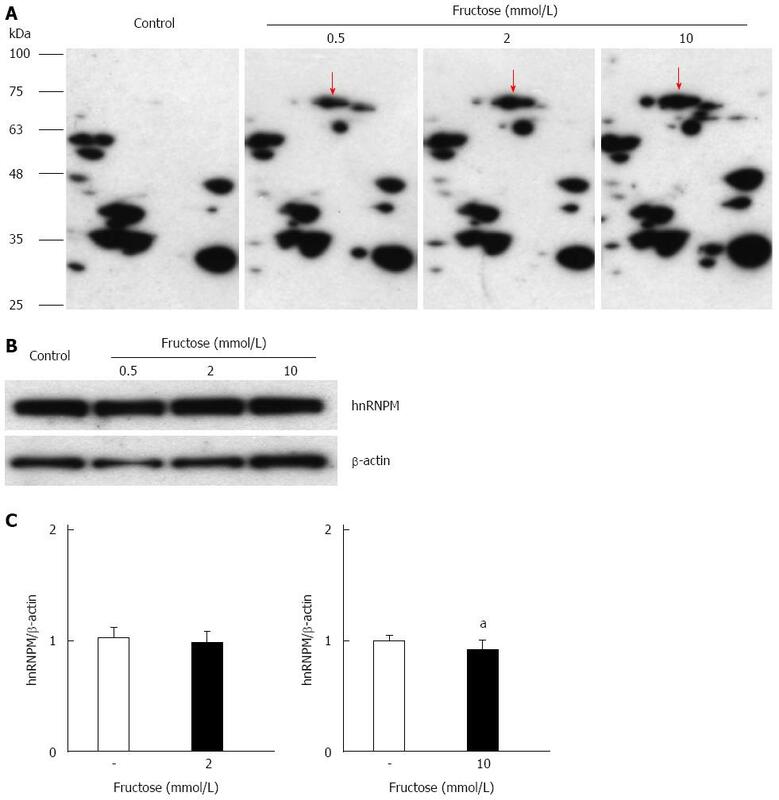 The study by Takino and coworkers focuses on the molecular mechanism with which excessive intake of fructose contributes to the development of an emerging and worrisome pathology such as nonalcoholic fatty liver disease and its inflammatory progression, NASH.